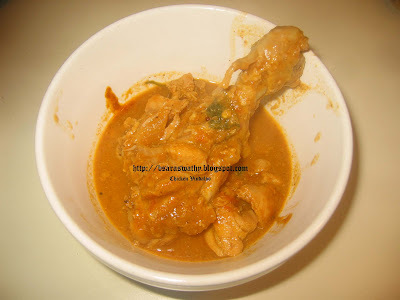 On Last Sunday I was thinking what to prepare for lunch and my hubby told me to prepare something with chicken...Chicken is one of the main non-veg item I used to prepare at home as it was my favorite dish. I would eat and try any dishes that is made with chicken. Instead of of making the same old type of chicken curry- I was searching my recipe book (well I have a habit of writing down all the recipe I have done and friend's recipes which I have tasted) as I wanted to try something different-that's when I came across the recipe of Chicken Vindaloo in my recipe book...I'm not sure when and from whom I got this recipe from.This is actually a Goan dish which is very spicy. 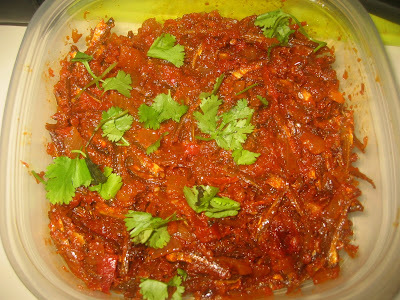 I have adjust the level of chillies according to my taste.. Coat a frying pan with little oil and roast the above said ingredient and blend into a smooth paste once cooled and keep aside. Coat a large wok with 5tbsp vegetable oil and add the mustard seeds. Once the seeds starts to crack add the cumin seeds,chopped onions and tomatoes. Saute them until the onions turn slightly brown- now add the marinated chicken cubes and paste 1. Cover and let it cook for about 15 minutes. Remove and add paste 2-bring to a boil..adjust the level of salt and remove from flame when the curry thickened. 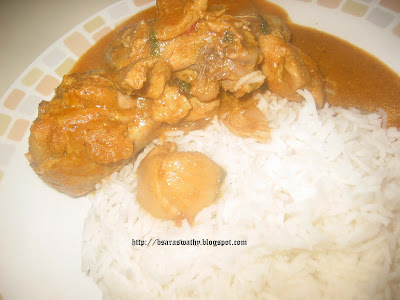 Serve hot with steamed rice or chapatis..
yummy vindaloo recipe..I should try it soon.